Some Chapters and Special Interest Groups (SIGs) produce newsletters, blogs, and other publications, and make them available to ICG members and the costuming community. 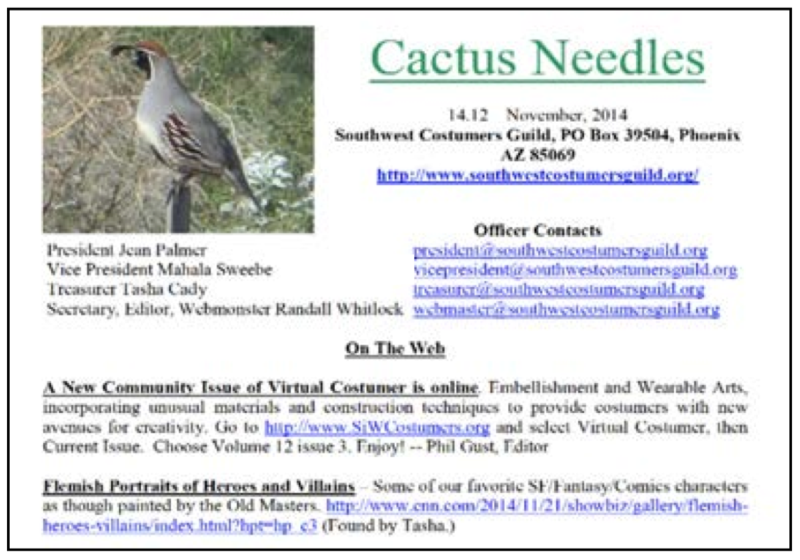 Cactus Needles is the monthly newsletter of the Southwest Costumers' Guild. In addition to chapter news and event, it also runs short articles on costuming topics. Availability: Freely available on publication. 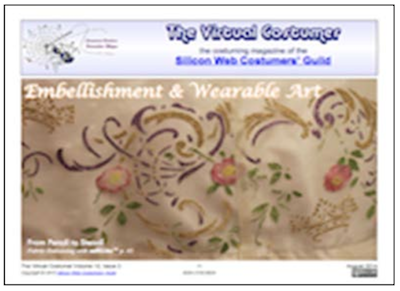 The Virtual Costumer (VC) is the quarterly costuming magazine of the Silicon Web Costumers' Guild. VC publishes feature articles on costume construction, reviews, interviews, how-tos, and event reports. Each issue of VC has a theme. 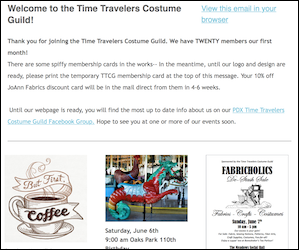 The Time Travelers Costume Guild Newsletter is the monthly newsletter of the Time Travelers Costume Guild of the Metro Portland, Oregon and Vancouver, Washington area. The newsletter publishes items on events held by the chapter, and community events that chapter members can participate in. Anyone is welcome to subscribe to recieve the newsletter by email. All issues are also available online. Copyright 2015 by the International Costumers' Guild.